Touch Screen Clean is the only cleaner available that is specifically made for touch screens. Touch Screen Clean clears tiny scratches caused by other cleaners and regular usage. Our unique 100% synthetic formula gives your touch screen an ultra-clear and bright look with a smooth touch. 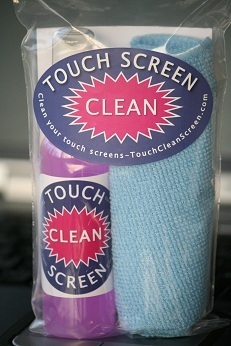 Touch Screen Clean is safe and effective to use on your screen protectors and other parts of your touch screen devices. The special Microfiber cloth lifts dirt and smudges without scratching your touch screen. Use the right product to keep your touch screens bright, clear and smoother than new with Touch Screen Clean!